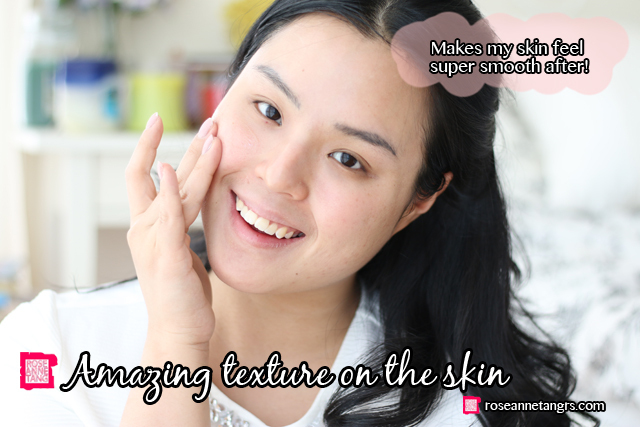 Today I’m going to share with you my everyday morning skincare routine. Because I’m an avid make-up person, my morning routine is I think a little more special – I make sure I properly take care and protect it from things I’ll meet during the day and of course my make-up has to look good over it! 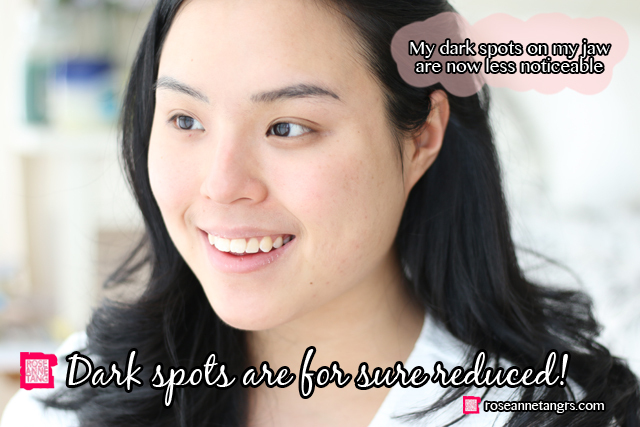 Before I start, I want to show you something that I’ve been using regularly every morning for the last 2 weeks – it’s the Clinique Even Better Clinical Dark Spot Corrector and Optimizer! 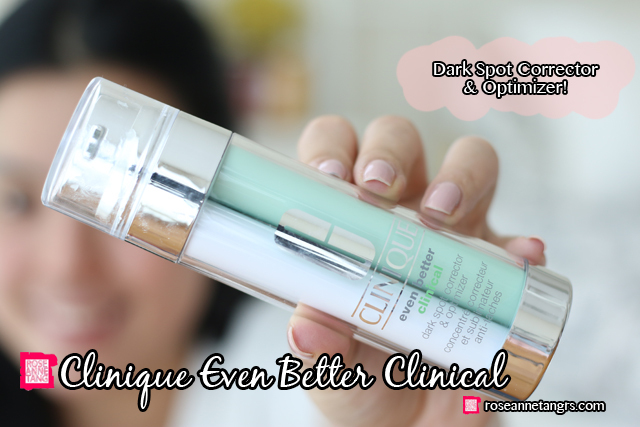 The Clinique Even Better Dark Spot Corrector and Optimizer helps to control hyperpigmentation due to stress and pollution and is one of my current skincare favourites. 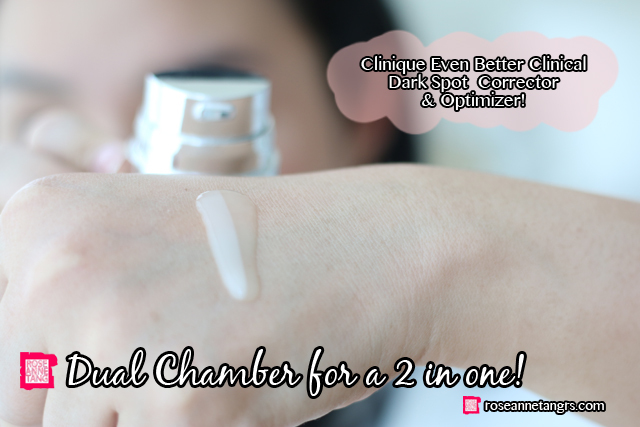 Let me tell you more about it (back to Roseanne Talking about the product) As you can see, it’s actually a dual chamber bottle that evenly distributes both the Clinique Dark Spot Corrector and the Optimizer and it also preserves the purity and potency of the ingredients until released! Hyperpigmentation for me is frustrating because I still have acne scars on my chin area and it can be made worse, along with dark spots because of the environment, stress and UV rays. As you can see, with each pump the dual chamber releases two items. The first is the Dark Spot corrector which contains a patented CL-302 complex that contains five brightening ingredients and helps reverse the look of dark spots, blemish marks and has won over 80 global beauty awards. The other is the Optimizer which is in the other chamber that prevents future pigmentation caused by everyday stress, UV and pollution. It has an optimizing cocktail of four different botanical ingredients which can quell irritation. Let’s move on with my morning routine. The first thing I do is always cleanse. I feel like cleanser is a really important part because it wakes you up and gets you ready for the day. If I need more moisture, I’ll go for a more hydrating creamy cleanser but if it’s not an issue, I’ll usually go for a zesty wake me up cleanser. It really depends on my mood. 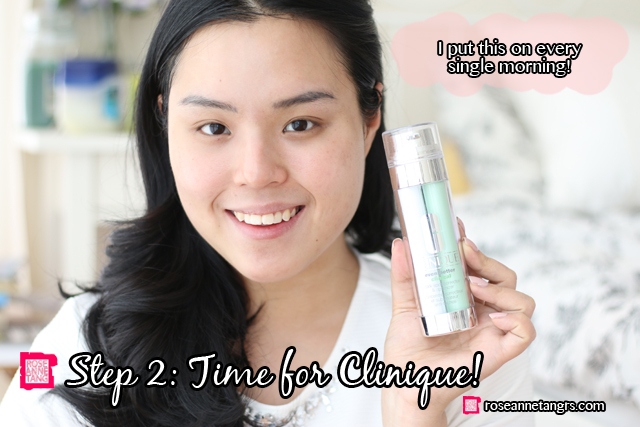 After I cleanse, I go straight to using the Clinique Even Better Clinical Dark Spot Corrector and Optimizer. I use this every single day because it really makes your face much smoother for your make-up to glide on better and of course it helps with my dark spots. It is gentle enough to be used all year round, and works on past acne marks as well. For me, I’ve really felt a difference in how radiant my skin looks and especially around my jaw area, my marks have been lightened. I know I don’t look like I have much going on, but I do have breakouts around my jaw. After using this for a couple of weeks, they’re still there but for sure ligthening up. Plus, I’m a huge beliver in the texture of this. It makes your face multitudes smoother and is a dream when applying make-up over it. So I make sure to put it on every morning. As you can see, I should have taken a before photo, but I really feel like the marks around my jaw area are slowly disappearing thanks to this product. 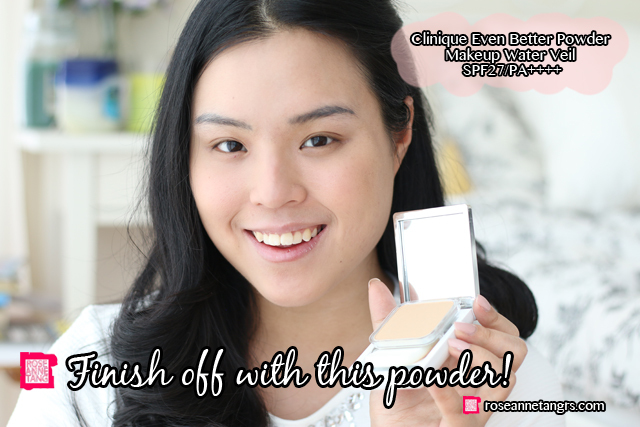 I’ve never been a huge fan of power foundations but I’ve really started loving the Clinique Even Better Powder Makeup Water Veil SPF 27/PA++++ – it’s actually my most favourite powder foundation to date. It is a luxuriously lightweight powder makeup infused with Clinique’s hydrating Even Better Essence Lotion. I love it because it really glides on weightlessly yet covers and clings like a liquid. The powder also produces a natural, perfected finish that feels as light as a soft veil of water and lasts all day while helping to protect against UV damage. LOVE this powder too! I usually would put on a sunscreen before this powder, but because the Even Better Powder Makeup Water Veil has SPF 27/PA++++, I’m good to go! This saves a lot of time and cuts a step in the skincare routine. Most sunscreens tend to be too oily and heavy on the skin, but instead, the Water Veil combats that! 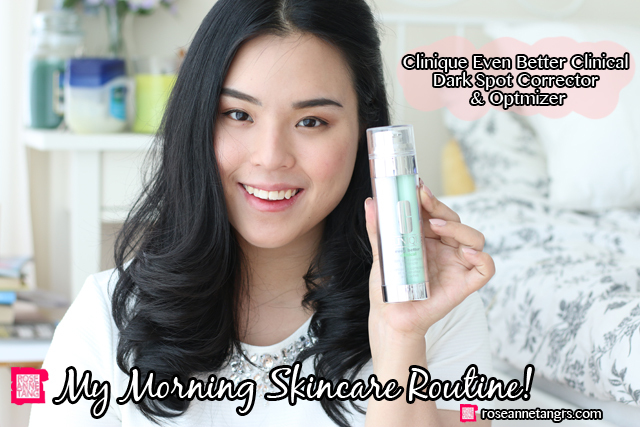 I hope you liked my morning routine! I totally recommend you check out the Clinique Even Better Clinical Dark Spot Corrector and Optimiser at Clinique stores! I love it! For all my readers, head over to http://bit.ly/1Pbiwv6 and stand a chance to win $267 worth of Clinique products! Contest ends 22nd March 2016! Tutorial: Valentines Day Sweetheart Look – Happy Valentines Day!